July 12, 2017, 9:30 a.m.
By Ricardo Bilton @rbilton July 12, 2017, 9:30 a.m. When it comes to politics, the first half of 2017 has given people plenty to protest. And while some have responded to current affairs by becoming more politically active, others, certain they can’t have an effect, have shrugged and tuned out. The liberal magazine The Nation is experimenting with new ways to get those on the left of both of those groups — the active and the inactive — involved. Late last month, the magazine launched Take Action Now, a weekly newsletter designed to offer readers three ways they can act on the issues and stories they read in the news. In one recent edition, the newsletter offered readers opportunities such as donating to the disability-rights organization ADAPT, whose members protested the repeal of the Affordable Care Act and cuts to Medicaid. 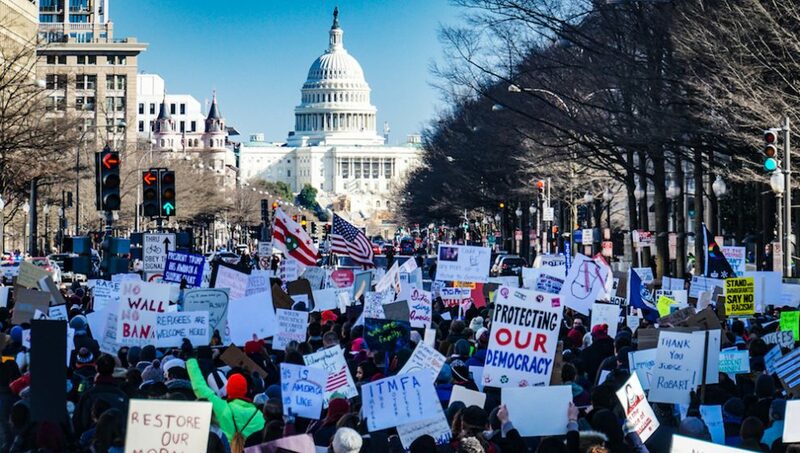 It also highlighted the work of #AllofUs, Democracy Spring, the Democratic Socialists of America, which were organizing sit-ins at senators’ offices. Another showed how they can help with organize the “Internet-wide Day of Action to Save Net Neutrality” later this month. Take Action Now also posts advocacy opportunities on its Twitter account. 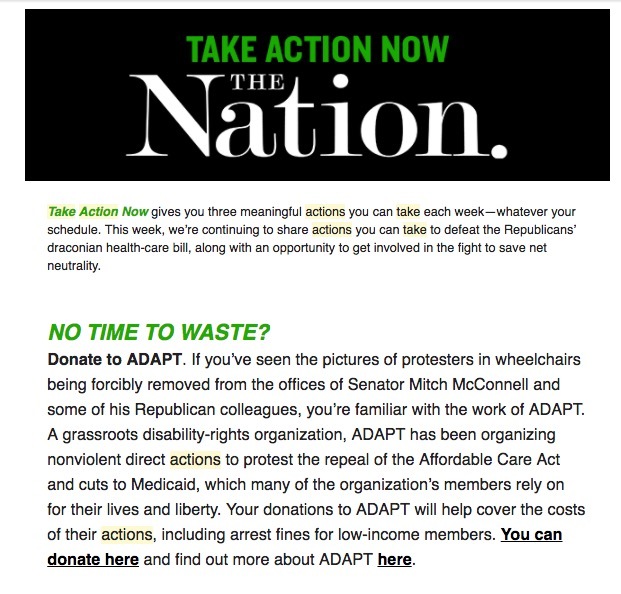 Take Action Now is an offshoot of The Nation’s Take Action program, which the magazine says has directed hundreds of thousands of readers to sign petitions, write to their representatives, and protest. The new initiative builds on that model, however, by acknowledging that not all its readers will have time to organize a sit-in or participate in protests. That’s why each of the three actions included in each newsletter are selected to fit the criteria of “No Time to Waste?,” “Got Some Time?,” and “Ready to Dig In?,” which vary in terms of how much time they will demand. Vanden Heuvel also says that she hopes that The Nation’s approach to activism will be a differentiator. “As long as we’re honest about our values and root all of this in our journalism, then there will be a natural synergy that readers will respond to,” she said. Photo of protesters tedeytan used under a Creative Commons license. POSTED July 12, 2017, 9:30 a.m.
Bilton, Ricardo. "With its Take Action newsletter, The Nation is giving readers ways to act on the stories they read." Nieman Journalism Lab. Nieman Foundation for Journalism at Harvard, 12 Jul. 2017. Web. 19 Apr. 2019. Bilton, Ricardo. "With its Take Action newsletter, The Nation is giving readers ways to act on the stories they read." Nieman Journalism Lab. Last modified July 12, 2017. Accessed April 19, 2019. https://www.niemanlab.org/2017/07/with-its-take-action-newsletter-the-nation-is-giving-readers-ways-to-act-on-the-stories-they-read/.